Because I really, really, really (did I say really) want to run this race! This 77.7 mile relay race seems like it would be so much fun! I just happened to find it while browsing races for the 2012 season even though there aren't that many advertised yet. After following numerous bloggers' experiences at the Hood to Coast Relay in Oregon (which is on my Wish List), I have the relay "itch". I don't think that I will be able to make it to Oregon for Hood to Coast anytime soon, so why not start smaller and relatively local? 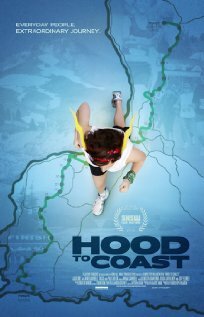 Fun Fact: The Hood to Coast dvd is on our Netflix list (which I guess is soon going to be Qwikster) and I can't wait until it is no longer "saved" and on our queue! Now here's my plea: we need teammates if this is actually going to happen. I'm not sure if I have Mike completely convinced or not (I just found this race last night) but I'm sure he would be game! Each team needs to have 7 teammates (they really took hold of the "7" theme and "ran" with it), which means that we need 5 more teammates. Now who would the ideal teammate be? Someone who loves running, loves spending time with other people who love running and wants to have a good time while doing it! Gender, speed and anything else doesn't matter to us as long as we finish by the cutoff time. The other logistics, transportation to exchange points, what legs we would run, what our team outfit (there HAS to be a coordinated outfit) would be, team name, etc. would be figured out later. According to the website, registration for next year opens on October 31, 2011 and early registration ends on December 31, 2011. For many reasons I would not want to let the early registration date slip by us so hopefully people will let me know if they are interested soon! It also says that it is open to 400 teams, but by checking out the last year's participant list only 75 teams raced so we should have no problems registering. If you are definitely game, let me know! Contact me any way you know how or leave a comment on this blog post. If more than 5 people want to join our team, we could always make a second team if enough people are interested. The big question: Who wants to race around Seneca Lake and have a great time while doing it?